I see the BREXIT vote as an opportunity to correct the glaring flaws in the EU concept of a Holy European Empire. Whether BREXIT wins or not in this vote, the EU will no longer be able to just ignore the disconnect between the concept and the bulk of the voters/tax payers in the EU. Of course if BREXIT does not win, it will slow down the inevitable reforms that the EU must introduce. I suspect that finally the fear of leaving will govern and that BREXIT will lose by a small margin. The EU politicians and bureaucrats will probably tout this as a win for the EU concept but, in fact, they will have to prepare for drawing back the various EU encroachments into the territory of national sovereignty. There is no argument that the European Union is a flawed institution. Its dysfunction has been on display in its fitful handling of the Greek debt and refugee crises, its bureaucracy is pathetically slow to recognize or correct its failings and it often acts like an out-of-touch and undemocratic elite. Part of that is the inherent inefficiency of an institution of 28 member states with big differences in size, wealth and democratic traditions, and which participate to different degrees in the single currency and border-free zone. Yet the E.U. is an extraordinary achievement, a voluntary union of nations whose histories include some of the bloodiest wars ever waged. However flawed the bloc, it has replaced blood feuds with a single market, shared values, free travel and labor mobility. Britain has always been something of an outlier in the E.U., joining what began as the European Coal and Steel Community two decades after it was formed and declining to participate in either the euro currency or the borderless Schengen zone. Yet there is no question that Britain has benefited from membership, both economically and as a strong voice in shaping E.U. policy. I see parallels in the “anti-establishment” views embodied in euroscepticism and in the “anti-establishment” views of the Trump supporters in the US. In both cases the revolt is a reaction to what is perceived as the over-weening arrogance of a political, liberal, elite who insist on defining political correctness and on telling the electorate that they know best what is good for them. In 2016, both in the EU and in the US, it is immigration and the flawed concept of multiculturalism which is dominating. It is occupying this ground which may well determine many of the elections. In fact the rise of the right-wing nationalists in Europe is the pendulum swinging back from 3 decades of self-righteous, social democratic dogma. Europe has moved further left in the 3 decades after communism fell than while communism was still an acceptable philosophy. But I note that some of the right-wing parties (Sweden, Denmark, France …. ) are losing some support as more of the centrist parties adopt more restrictive measures on immigration and take away this ground from the right. Take Trump’s immigration ground away from him and he will not stand a chance. The EU has been facing an unprecedented assault on its borders with the refugee crisis. So much so that internal dissent about the free movement across the EU has never been higher. The Schengen agreement has been suspended and member states are reintroducing border controls. Political disparity across the member states ranges from far-left governments (Greece, Portugal….) to nationalistic governments which include far-right elements (Poland, Hungary…). Economic disparities across the member states are also extremely wide with the poverty (relative) of Greece and Romania at one end and the wealth of Scandinavia and Northern Europe at the other. Some members pay only lip service to fiscal responsibility and balanced budgets (inevitably these are left-of centre governments and includes France) while others keep within the nominally required deficit limit of 3% of GDP. Civic values are not homogeneous across the EU and individual behaviour follows national mores. In Greece, to pay tax is almost a “sin” and tax avoidance is a national game. In Sweden, it is almost considered a sin for a handyman to be paid in cash for fixing a creaking door and waiters are expected to declare and offer up their tips for taxation. At the core of the EU idea has been a vision of a Holy European Empire which is far, far more than a free trade zone. It was a vision of a modern Utopia, a homogeneous Empire, a single state, administered from Brussels and stretching far into Asia, all the way till Kazakhstan. People would be citizens of Europe first. The nations would fuse their sovereignty into that of the Empire. Values and living standards and employment opportunity and prosperity would be uniform. There would be a single currency and a uniformity of education, health and welfare services across this new Empire. It would be a Holy Empire in that the values it espoused would be the envy of, and the standard aspired to by, the rest of the world. There’s nothing wrong in having such a vision, but instead of trying to do this over a few centuries or a millennium, the EU has tried to do this over decades. Worse, EU leaders have not bothered to carry people with them but have allowed the administrators to lead the way. Country after country has been admitted to membership even though the disparities of values and prosperity and politics and behaviour were huge. 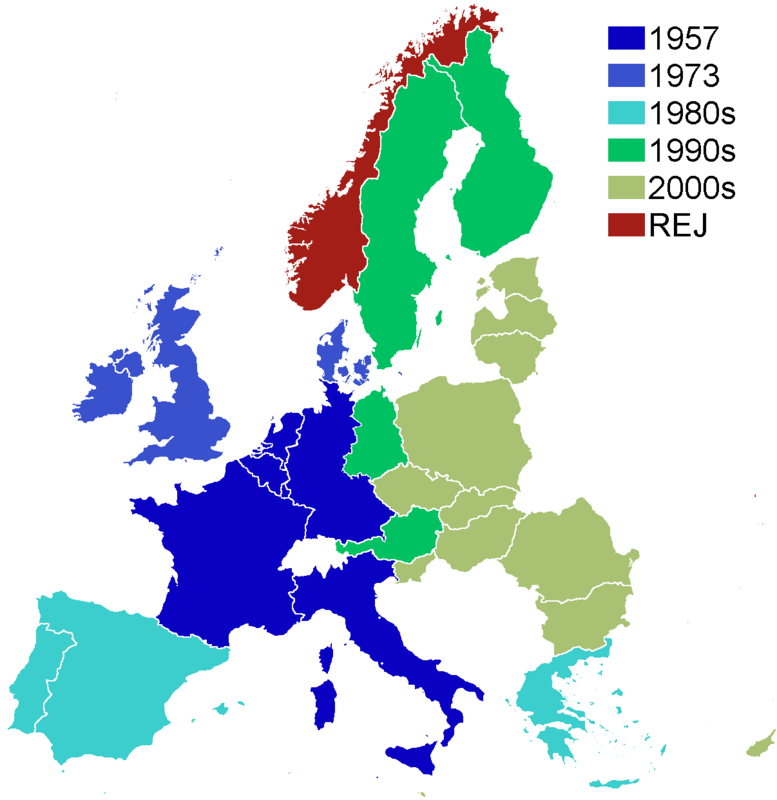 In the last 30 years it has been an aggressively expansionist EU. The tail has been wagging the dog. Enforced monetary union has been used as tool to try and enforce a fiscal uniformity instead of being as a result of fiscal harmony. Free movement of labour has been encouraged before establishing harmony of unemployment and welfare benefits. There has been a significant number of people moving (always towards the more prosperous nations) – not for the sake of employment – but for the sake of the welfare services available. Brussels has became a place where the worst practices within member states become enshrined as the norm, rather than being from where best practices are disseminated. The expansion has gone too far, too fast. And now the cracks can no longer just be papered over. The geographical boundaries have been expanded and the borders have become indefensible. So much so that “the fall of Rome” is being looked at as an analogy. …. Let us be clear about what is happening. Like the Roman Empire in the early fifth century, Europe has allowed its defenses to crumble. As its wealth has grown, so its military prowess has shrunk, along with its self-belief. It has grown decadent in its shopping malls and sports stadiums. At the same time, it has opened its gates to outsiders who have coveted its wealth without renouncing their ancestral faith. Uncannily similar processes are destroying the European Union today, though few of us want to recognize them for what they are. ……. The EU has to put its grand visions of a Holy European Empire on the shelf for now. It has to focus on the building up of the fundamentals of economic prosperity and fiscal rigour and trade among its members, and forget – for now – its ambitions to force economic uniformity on its members. It has to stop interfering and trying to be a social engineer. Values cannot be imposed, they have to develop naturally. When all member states have achieved, each in its own time, a uniformity of values, fiscal structure and economic prosperity, a single currency will be the natural outcome. And if a Holy European Empire is ever to develop it can only do so when it becomes the obvious choice for the peoples of its member states.